We are going to talk about duplex communication in ASP.NET MVC web apps, without Flash, Java, SL or anything like that. I assume that you have a good understanding of comet techs because we’ll look into a ready-to-use library so most of the hard things are abstracted away. This library is PokeIn and I use it as the base library to provide real-time things on my gaming site fumind. I’m going to write about solutions I used to provide these real-time updates and gameflow. The site provides gomoku and gomoku-alike games so don’t expect some fancy action game, these are strictly turn-based stuffs. Because of this we don’t need really fast solutions, so we can go with (or fall back to) classic comet solutions, as the speed of a quick ajax call is good enough for our needs. All the three point is about single responsibility and abstraction. (1) We don’t want to tie our code to a specific comet solution so we need some kind of abstraction which is PokeIn in our case. (2) We don’t want to mess up our MVC actions with PokeIn calls but we need a consistent way to notify our system that something happened so if anybody interested in it will get a notification and can handle it in a separate component. (3) After we have domain events we can write listeners which can directly notify the PokeIn clients. Incoming actions are plain MVC actions and they will return an OK signal every time it succeded or some kind of error message if something went wrong. These actions will raise domain events so a listener can notify everybody on the outgoing channel, which is PokeIn. This is the key. Because nobody receives the updates directly as the action response we can treat everybody equally when updating the clients. This will lead to a predictable environment which is good for maintainability. 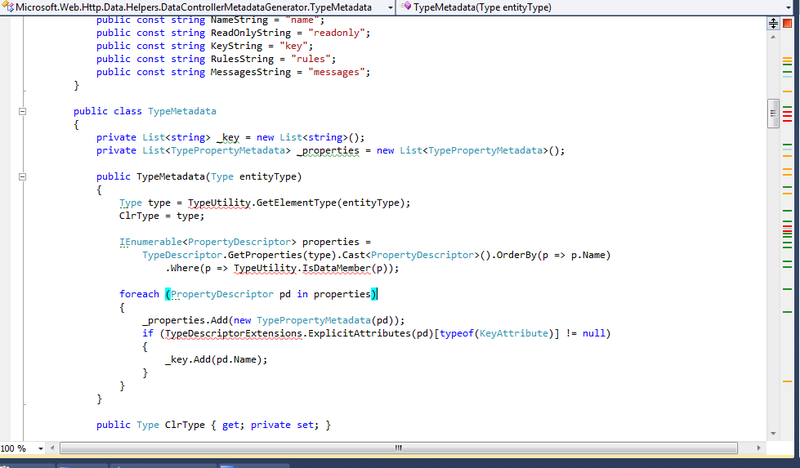 Let see some code from the fumind.com codebase. One of the most important parts to achieve what I’m talking about is to create the concept of the domain events. You may find several definitions on the internet, I use it as a mediator pattern implementation. With this we are over the first step, we have the action and it has only one responsibility: delegating the makemove attemp to the domain logic. We are handling the updates in a subscriber which listens to the MoveMadePayload. This can be (and will be) improved to handle when a listener throws an exception, but it’s ok for now. So basically all domain event works because this event broker. You can easily see how we can subscribe to one or more event. It really doesn’t worth to include the whole makemove notification logic here so I just wrote the steps as comments. Of course we need to define the PokeIn clients to update (we can define different branches too, e.g. for makemove I define observers and players separately), we need to build up our dto (data transfer object, I build up slightly different dtos for observers and players) and call into the PokeIn library as you can see. So anybody can hook into this client side root point and can handle any PokeIn calls, such as our makemove action. Real-time comet callbacks are treated exactly the same as if you need to update the clients due to a scheduler event (time over for example), so it’s easier to maintain the code (consistency). You can do duplex communication in a lot of ways but I think this one is really simple for starting off and provides a consistent environment to deal with the upcoming tasks. And it is reliable :). My plan is to share experiences with the SPA (which is a little bit paused now by the team), so don’t expect a complete guide about it now, this will be a series of posts as we move forward and resolve new issues. As you may already know, SPA is removed from the ASP.NET MVC 4 stack and continued as a separate project. Another problem is the pause on it, so it’s a very unstable area. New problems come day-to-day and old ones get resolved. For example when I first wrote to the codeplex discussion thread about that we resolved the incompatibility between SPA and RC we had some server side problems that disappeared with the current nightly build, but we don’t have OData filters now :). If you try to run the solution now you will get an application error. This is because the Web Api changed since the beta SPA. 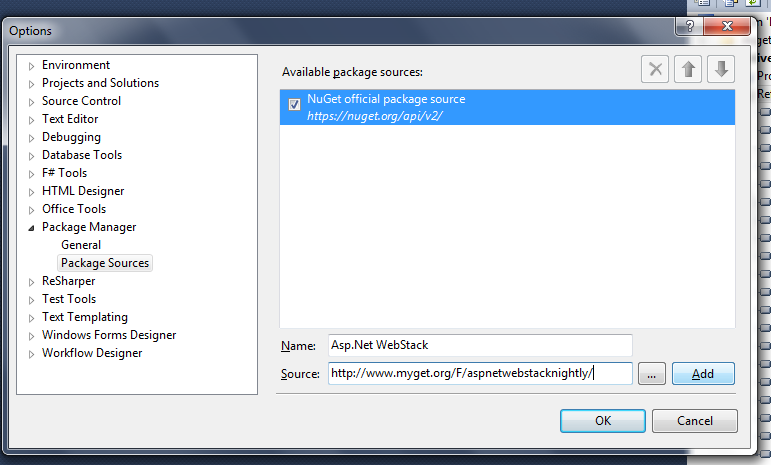 You can find these packages in the aspnetwebstack source, but now they belong to the Microsoft. * namespace (probably because they continue SPA as a single project). This is because we probably have to make some changes to make it work or to keep our solution working at the next nightly update (not absolutely necessary now, but it’s safer). 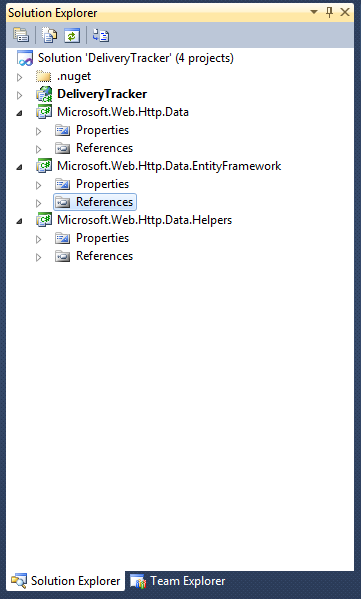 Open up the Runtime.sln (which comes with the latest sources), and check out the Microsoft.Web.Http.Data project. There you will find some linked files in the Common folder so don’t forget to copy those too. 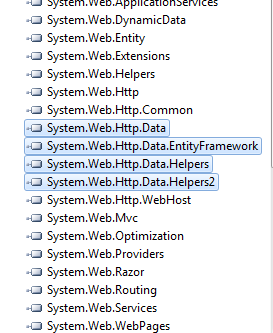 Include the files and do the same with the Microsoft.Web.Http.Data.Helpers and System.Web.Http.Data.EntityFramework. If I missed something here then you will need to figure out it yourself (or ask me in a comment), but I hope this list is complete. The next few steps are temporary solutions, but this whole thing we do here is temporary anyway. So when you try to build it you will get a lots of internal usage error, but who needs internal protection while our goal is to hack around the problems? So change them to public. Do it everywhere the compiler complains about it. Another problem you will face here is the resource accessing in Errors.cs, you can figure out what’s going on here if you want but I don’t care about the concrete error resource now (it’s really a temporary solution), just change it like in the attached picture. 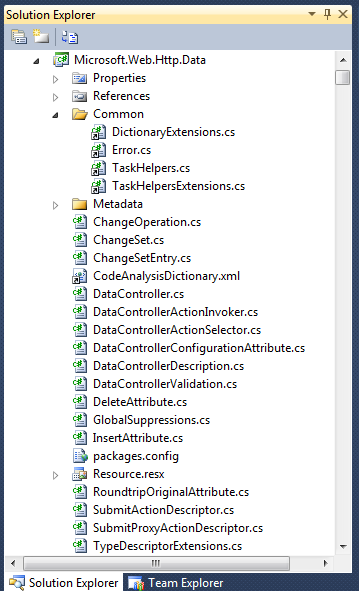 directive somewhere in the Microsoft.Web.Http.Data that we don’t need and the compiler can’t find it. 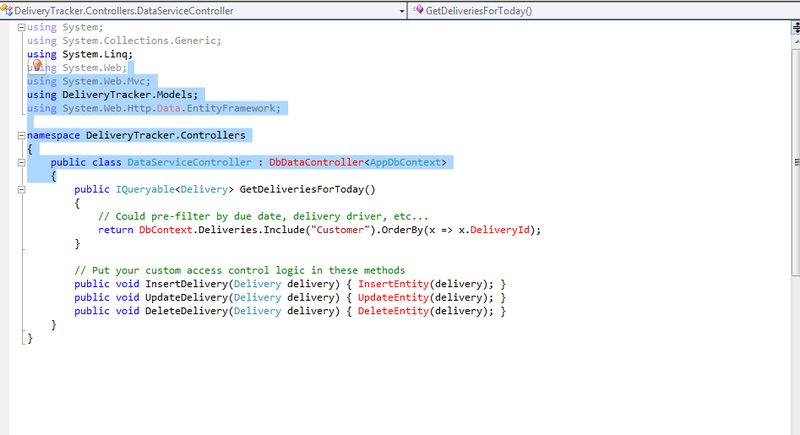 If you have ReSharper then it’s more easy. You should have a successful build now (and I hope you have!). 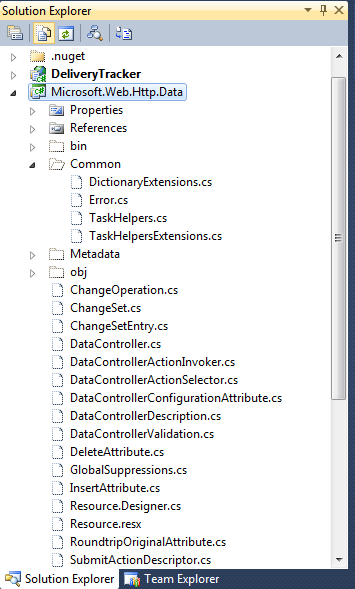 Delete EntityFramework and install a new one from nuget because we use a newer one in Microsoft.Web.Http.Data.Helpers and we don’t want version missmatch errors. Also we have to update our namespaces in our web.config files (in the normal and under the Views too). 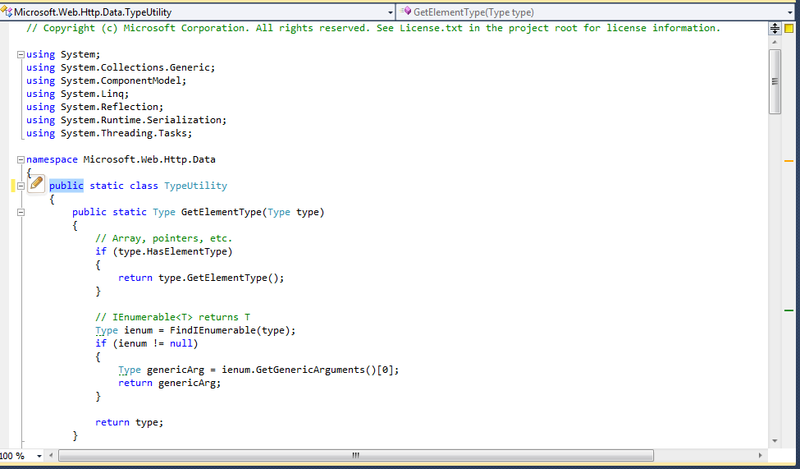 Ok, the code is ready and it should run now (we will have client side errors). The new server side code generates a different result and our upshot.js is from the beta package. We need to update and fix that too. Check out the SPA project in the Runtime solution. 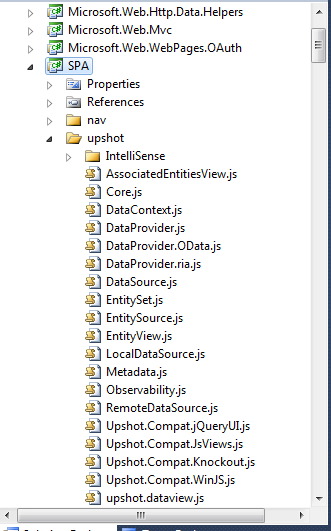 Upshot made up from different components, so you have to build (combine) the files. When I made this step for us, the upshot.js had some incompatibility with the current server code, but we will check out what’s the situation now. I made a little cmd tool to combine the files, you can find the source code here. Copy the exe into the SPA folder and run it. You should have an upshot.js now. Overwrite the original with it and change the path in the _SpaScripts.cshtml partial. Well, upshot still has incompatibility problems, so lets fix them. 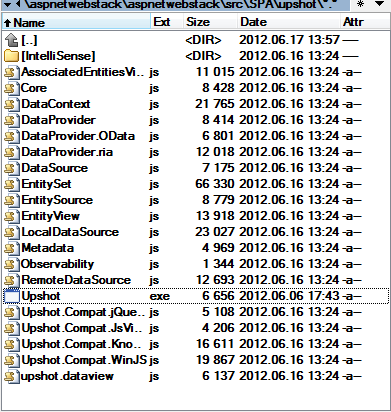 The main difference between the old and the new json pushed by the server is the structure, you can inspect it. The other is the type handling. I’m not going to write about them one-by-one, you can download the fixed upshot.js and the script file which contains the actual fix functions here. In the upshot.js I have marked the fixed parts with a comment: //FIX, so you can check out them. You have to include the SPAHacks.js before upshot to make it work. Refresh the page and voila. This is it. I hope everything worked out, but if not, you can always ask in comments. As you can see it’s not a fail proof way to build applications, so I suggest to wait until a stable release comes out. If you don’t want to wait (like me) you can play with it, and I’m going to write more posts when we have more problems.